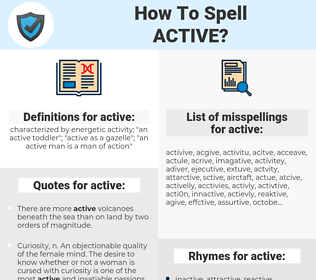 What are the misspellings for active? What are the common mistypes for active? 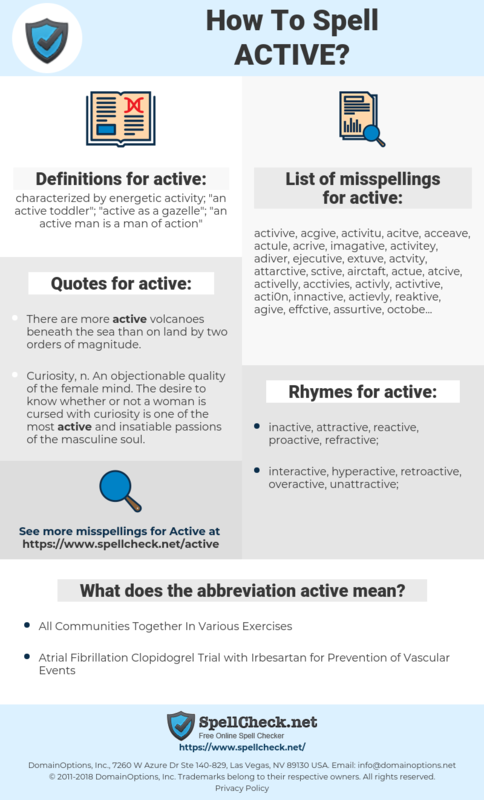 What is the definition of active? What does the abbreviation active mean? What are the quotes for active? What are the rhymes for active? What are the translations for active? What are the common typos for active? This graph shows how "active" have occurred between 1800 and 2008 in a corpus of English books. druk, werkzaam, werkend, levendig, actief, bedrijvig, activerend. effectif, actif, vif, vivant, dynamique, présenté, présents, en fonction, en service, en marche, en exploitation. wirksam, aktiv, eingeschaltet, wirkend, regsam, lebhaft, rege, Tatform, aktiviert, engagiert, in Betrieb, ablauffähig, quicklebendig. アクティブ, 積極的, 活動的, 能動的, 能動, アクティヴ, 主体的, 行動的, 動作状態, のうどう, のうどうてき, どうさじょうたい, こうどうてき, せっきょくてき, しゅたいてき, アクチブ, かつどうてき, 活動的な. aberto, ativo, efetivo, eficazes, activa, atuante, activas, participativa, actuante. activo, activos, listo, vivo, activado, vigoroso, operante.